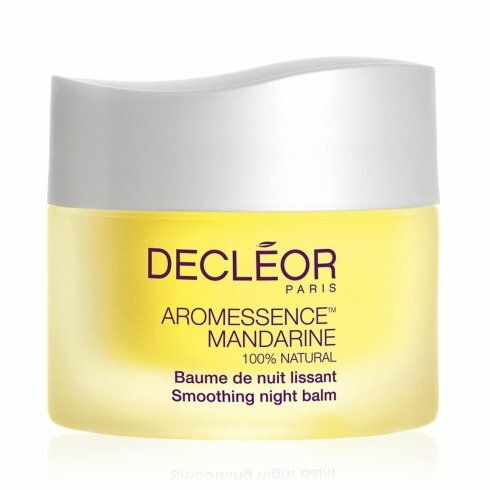 Decleor Aromessence Mandarine Smoothing Night Balm is a fine textured balm that intensively regenerates the skin at night using Evening Primrose Plant Oil and Shea Butter while Cupuacu Butter provides optimal hydration. The antioxidant powers of Mandarin Essential Oil help to visibly smooth wrinkles and create a luminous skin finish. Suitable for the first signs of ageing. Directions: At night, after cleansing, warm a small amount of Decleor Aromessence Mandarine Smoothing Night Balm in the palm of your hands and apply to a cleansed face and neck in light sweeping strokes. Ingredients: Key Active Ingredients: Orange Essential Oil Evening Primrose Plant Oil Mandarine Essential Oil Shea Butter Cupuacu Butter.